Welcome to the Clojure Password Manager Tutorial. 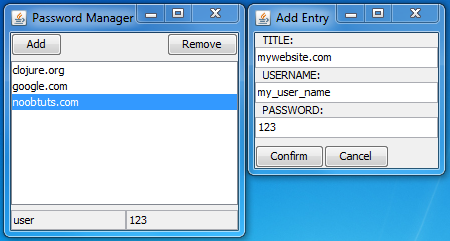 We will develop a simple Password Manager with only 77 lines of code by using the powerful seesaw library for our GUIs. As usual we will focus on plain simplicity. Additional features like save & load will be left open for the reader to implement afterwards. As just mentioned, we will use the seesaw library for our GUIs. Seesaw is pretty much just a wrapper for Java's Swing library, but wrapped in a way that allows us to use it in the most elegant way possible in Clojure. Reading through the Seesaw REPL Tutorial should be enough to understand everything in this tutorial. Note: we will also need clojure's string later on, hence why we already added it to the require part as well. Note: this makes the GUI look like a native GUI from the operating system, instead of that blue Java GUI style. The display function can be found in the tutorial that was referred to above. The yesno-dialog function simply pops up a dialog with a Yes / No answer option, while also letting us specify the shown message. Note: we will use a ref because the dosync mechanic could come in handy when adding more advanced features to the password manager. The main difference between those frames is that closing frame-add will just make the frame-add invisible, while closing frame-main will quit the program. 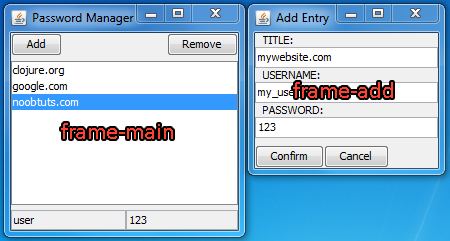 (def frame-main (frame :title "Password Manager"
But we will use a custom display function from here on. And we will modify the display function over and over again so it places all the elements where we want them to be. It's time to add the main listbox that shows all the entries. It's important to keep in mind that it only shows the entry titles (for example the website name), but not the id or password. Note: lb-main stands for 'listbox-in-frame-main'. Enjoyed this preview? Become a Premium member and access the full Clojure Password Manager Tutorial!